Today AdWords is almost synonymous with digital advertising—most marketers are aware of or already using AdWords to target their audience with ads online. But because that can be a crowded space, how can you optimize your advertising over time? Generating more leads from Google AdWords can be tough once you reach a certain threshold. In this blog I will walk you through four tactics that will allow you to break through that plateau and scale your AdWords lead generation. Single keyword ad groups are one of the most effective strategies for generating more leads. When Audi implemented this tactic, it saw a 102% uplift in conversions. Most advertisers place 10 or even 20 keywords in each ad group. But it is very difficult to write an advertisement that is relevant to all of the keywords within the ad group. The result is a poor match between what users are searching for and your ads, which yields lower CTRs, less traffic, and fewer leads. Instead, place each of your keywords within their own ad group. Because only one keyword will trigger your ad, you can write highly specific adverts. 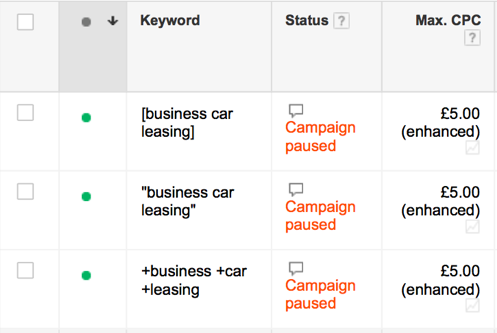 To implement single keyword ad groups, add each keyword into an ad group in all three match types, as shown below. Description: Features and benefits + Call to action. You can see here that the advertiser included the keyword in the headline and the display URL. They used the rest of the copy to mention features and benefits and then included a strong call to action that directs consumers what action to take next. One little-known feature within AdWords is called dynamic text insertion, which allows you to change the text on your landing page. This is an effective way to make your landing pages more aligned to what users are searching for and, therefore, increase the conversion rates and the number of leads being generated. Changing the location is just one way to make your landing pages more relevant. 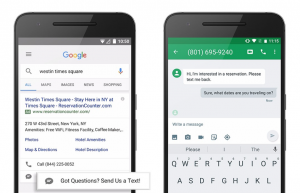 Google added a new advert extension towards the end of 2016 that allows searchers to text advertisers from their adverts. 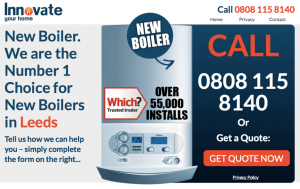 Here is an example of an advertiser using this extension. 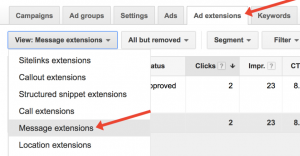 You can implement this within the ad extensions section of your AdWords account. Step 1. First, navigate to the ad extensions tab and then view message extensions as shown below. Step 2. Click the red “ad extensions” button. Step 3. Enter the name of your business and the phone number that you would like to receive texts on. In the “extensions text” box, enter the message that you want people to see alongside your ads and then in the “message text,” enter the message that users will text you with. Step 4. Click “save” and you should see your extensions appear next to your adverts within Google’s search results. Converting your national and regional campaigns to local campaigns is an effective way to lower your cost per lead and generate more leads. Studies by Clicteq have shown that geotargeting can increase the number of leads by 21.9% and decrease the cost per lead by 38.5%. As shown in #2 above, geotargeting is where you display the name of the location where the advert appears within the advert copy. For example, here is a geotargeted ad aimed at York, showing the location within the ad copy. Step 1. Duplicate your national or regional campaign and then change the location that it is targeted at to a city that was within your national or regional campaign. Step 2. Edit the ad copy to reflect the name of the city the ads are targeted at. For the best results, place the name of the location within the headline of your ad copy and in the display URL. 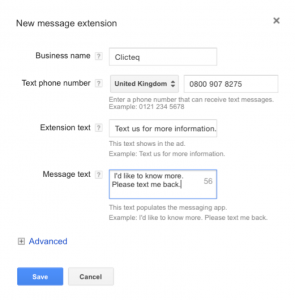 If you are struggling to generate more leads with AdWords, these four tactics can help. 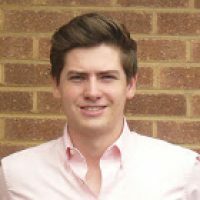 If you do nothing else, implement single keyword ad groups as they are one of the most effective, yet underused, tactics for generating more leads. Do you have any tactics to add to the list? If you have any questions about this article or additions, please feel free to leave a comment below.